There is nothing more satisfying for a fishermen than catching the largest bass in the lake. Unfortunately, bass fishing is not always easy, especially during winter. Nonetheless, with the right fishing lures, it is possible to catch the largest bass in the coldest of winters. Jerkbaits for Bass Fishing are One of the best fishing lures. Designed to mimic the shape and swimming of small fish, jerk baits are the perfect lures for bass fishing. To entice large bass, some jerk baits are designed to look like small shoals of fish. In this article, I have compiled a list of the best jerkbaits for bass fishing based on my experiences. But before that here are some of my best jerkbaits fishing tips. When fishing with jerkbaits a small diameter fluorocarbon line is a must have. The reason being the fluorocarbon lines are virtually invisible to most fish species. Additionally, jerkbaits are used mainly in clear waters thus are a better alternative to monofilament lines that can easily be detected by fish in clear waters. Thus, using a fluorocarbon line when fishing with jerkbaits will increase your chances of catching a large bass. Sadly, most fluorocarbon lines tend to sink, which can be problematic. To remedy, this goes for the lightest fluorocarbon line available. Fluorocarbon lines are exceptionally sensitive, which makes them ideal for fishing light biting bass, especially during winter. If You Are Looking For More Information About Best Fishing Lines Go Here Right Away. As already stated in the introductory paragraph, jerkbaits are designed to look like small groups of fish. That being said, the bass has a tendency of attacking small shoals of fish from underneath. As such, when using jerkbaits, it is advisable that you find a spot where the water is slightly deeper. The recommended depth is 10 feet as jerkbaits submerge under water slightly giving you plenty of room to work wit. In essence fishing in water that is over ten feet deep eliminates the risk of the jerkbait sinking all the way down. Finding depth of water is easy with fishfinders, click here to read more about top fishfinders in 2018. You have probably heard this before, but I am going to repeat it just in case you have never heard when jerkbait fishing try and chase the wind. The wind makes it difficult for large bass to differentiate between your jerkbait and real fish. Thus, when fishing in clear waters, the wind will be crucial to your success. During winter when the water is clearer the wind will help you fool large bass. In essence, jerkbait fishing is primarily based on visibility. Bass fishing is an art that is highly dependent on the tools used. In this regard, I prefer using metallic and translucent colored jerkbaits in clear water conditions. The reason being that in such conditions a bass' sight is in excellent condition. Thus using natural colors is the best way of confusing bass. Contrastingly, I use brightly colored or matte colored jerkbaits when fishing in cloudy conditions. This I do to give my jerkbaits a better silhouette. Mostly, the color of your jerkbait should match the visibility level of your fishing point. The efficiency of your jerkbait will depend largely on the equipment you are using, i.e., the rod, reel, and line. Since I have already talked about the line, I am dedicating this paragraph to the rod and reel. Personally, I use a baitcasting reel, and for good reasons. A baitcasting reel is faster compared to spinning reels. Additionally, my baitcasting reel helps me achieve better jerking action. As for the rod, I use a 7-inch rod with a solid backbone. My 7-inch rod is not too long that it hits the water during the jerking motion, and it is not too short either. Also, my 7-inch rod is a soft tip, meaning that it is less likely to rip a fish's mouth open. If You Are Looking For More Information About Right Bass fishing Reels Go Here Right Away. Every jerkbait comes with hooks. However, these hooks are not always the best the market has to offer. Thus it might be a good idea to swap your jerkbait's stock hooks with better and sharper hooks. However, when you are replacing your stock hooks consider the weight of the new hooks. If the replacement hooks are too heavy, they can cause the jerkbait to sink quickly. Also, heavy hooks can cause the jerkbait to lose its suspending action. Thus, if you do not know which are the best hooks to use on your jerkbait replacing your bait's stock hooks might not be a good idea. There are other accessories you can buy to improve the action of your jerkbait a prime example being a lead tape. 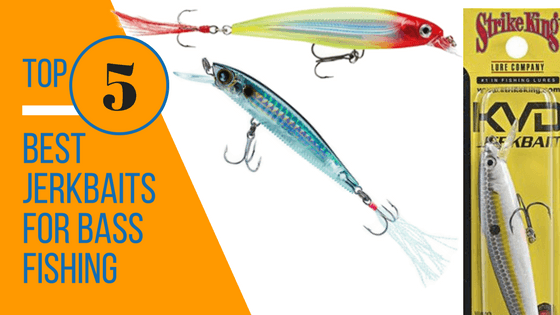 Click here to see more bass fishing lures that comes in variety of hooks. The first time I laid my eyes on the Rapala X-Rap XR10 jerkbait, I could tell that it was well made. Apart from being well made, this jerkbait has sharp details and a realistic paint work that makes it look like a real fish. As for its hooks, they feel sturdy and are needle sharp. With a running depth of 3 to 8 feet, this jerkbait is approximately four inches long and weighs 4.3 ounces. To make it an ideal lure for fishing in waters with low visibility, this Rapala fishing bait features a rattle. This jerkbait has great action and is thus an ideal fishing lure for bass fishing. The liveTarget Emerald Shiner Jerkbait is designed to mimic small fish swimming erratically. Thus you are likely to catch large bass with this jerkbait. However, this jerkbait is designed for use in clear waters. Towards this end, the LiveTarget Shiner has a neutral buoyancy, which means it can stay in the strike zone for longer. One of the best things about this jerkbait is its subtle action, which entices lethargic bass during winter. Another 4-inch jerkbait that has found its way on my list is the Strike King KVD Jerkbait. The latter is a decent jerkbait that features 3D eyes and a realistic design. Thanks to its great suspending action, this jerkbait is ideal for fishing in cold, clear waters. On the other hand, its weight transfer system gives it exceptional castability. The hooks on this jerkbait are black nickel hooks which are as exceptional as the jerkbait itself. Thus you do not have to worry about replacing the hooks. Coming it at number four on my list is the dynamic Rapala Husky Jerkbait. As its name suggests, this diving fishing lure is a suspending lure that is ideal for waters 1 to 4 feet in depth. Interestingly, this jerkbait has a multiple BB chamber which gives it a great balance in the water. Also, this multiple chambers prevents this jerkbait from rolling. In regards to construction, this fishing lure is made from a sturdy and durable ABC plastic. The hooks on this jerkbait are large ultrasharp 10-inch hooks. Last but definitely not least is the Yo-Zuri 3DB Jerkbait In addition to having an English mythology inspired name, this jerkbait is perfect for catching all freshwater fish species. Also, this jerkbait has a suspension depth of 3 to 5 feet. Designed to mimic the swimming of a wounded fish, this jerkbait fishing lure has highly detailed color patterns that resemble a real fish. This gold shiner measures 4.5 inches; however, there is an 11.5-inch variant available. Depending on how long you have been fishing, the name Rapala is one you probably have heard of. After all, Rapala is arguably the largest manufacturer of fishing lures in the world. Thus it should not be a surprise that the number one jerkbait on my list is the Rapala X-Rap XR10. The latter jerkbait is not only affordable but is also well designed. Therefore, although I have had the misfortune of losing a couple of my Rapala jerkbaits in the past, the Rapala X-Rap XR10 is a jerkbait I still would go for.